The terms "Flat Pack Homes", "Prefab German Houses", "Kit Houses" or "Package Homes" are often used when speaking about house manufactured off-site and then assembled on site. The terms "Kit House" and "Flat Pack" are alright when talking about a kit for a garden shed or children's play house, however they can hardly be used for high quality off-site manufactured German houses. Building an energy efficient, air-tight house with a longevity cannot be done like a DIY job but needs lots of experience, craftsmanship, the right skills and - last but not least - and the right high quality materials and care. The term "prefab" actually matches very well when speaking about a house that was prefabricated in the sheltered environment of a factory and then assembled in situ. However, the term "prefabricated" still has a negative connotation with a lot of British consumers based on the experience with post-war prefabricated houses built in their thousands in Britain. According to the 1944 Housing Temporary Accommodation Act, the houses were designed to last only about 10 years. Naturally, the quality and standards were not very high. But there is no reason for a bad reputation for prefabricated houses today. There are multiple manufacturers who produce homes in the sheltered environment of a dry factory with all the added benefits from a quick assembly on site to precision build. With long standing tight energy efficiency requirements and a demand for high quality products, Germany pioneers prefab technology. There is of course a difference in quality, construction and price between various manufacturers and Premium Suppliers like Stommel Haus use their own unique wall construction, different levels of kitting out the German houses and specific ways to run the project. 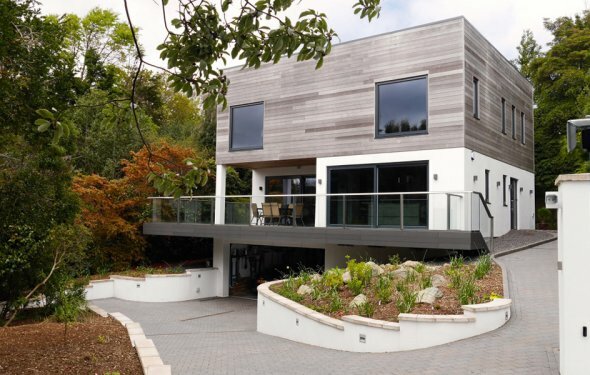 How can a prefabricated home be bespoke? Let's take the example of Stommel Haus, one of the leading Premium German Manufacturers. We produce around 70 to 80 bespoke off-site manufactured timber houses per year. Each and every house manufactured in the factory in Germany is a bespoke design. Stommel Haus UK sales agents do a thorough briefing with their clients to determine the requirements for space, layout, the architecture and a target budget, then look at the plot and planning situation to create the bespoke design. The specific design of the walls, ceilings and roof truss, the vast experience in timber construction, the CNC support in production allow the manufacturer to pre-construct almost any kind of architectural design. The very experienced staff take the bespoke design and translate it into meticulously prepared production plans - a process performed under tight quality control.